New Delhi: Eight MBBS practitioners have been fielded by various political parties in electoral arena including Dr Misa Bharti, daughter of Rashtriya Janata Dal(RJD) head Lalu Prasad. These eight MBBS and MD degree holders are now going to contest for the Lok Sabha seats in Bihar. The Lok Sabha election in the state will be held in seven phases with the first one on April 11 and the last on May 19 while the counting of votes will take place along with the rest of the country on May 23, as per the Election Commission. 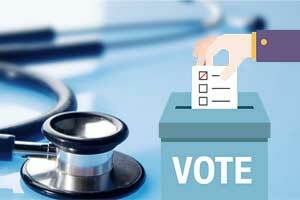 These eight doctors who will try their luck in politics include Dr Ashok Kumar, Dr Mohammad Javed, Dr Misa Bharti, Dr Rajbhushan Choudhary Nishad, Dr Varun Kumar, Dr Alok Kumar, Dr Sanjay Jaiswal and Dr Raghunath Kumar. Among these, four are from Rashtriya Janata Dal (RJD) led Grand Alliance, three from National Democratic Alliance (NDA) of JD (U)-BJP-LJP and one from the Aam Aadmi Party (AAP). RJD Grand Alliance consists of Dr Ashok Kumar from Samastipur, Dr Mohammad Javed from Kishanganj, Dr Misa Bharti is in the fray from Pataliputra, and Vikassheel Insaan Party’s Dr Rajbhushan Choudhary Nishad is contesting from Muzaffarpur. On the other hand, NDA of JD (U)-BJP-LJP is being represented by Dr Varun Kumar from Sitamarhi and Dr Alok Kumar Suman from Gopalganj while BJP old warhorse Dr Sanjay Jaiswal is again in the fray from Paschim Champaran. Moving on AAP has decided to field orthopaedician, Dr Raghunath Kumar from Sitamarhi, which will be the only Lok Sabha constituency where two practising doctors will be contesting against each other. Making a debut, Dr Varun, Dr Alok, Dr Rajbhushan and Dr Raghunath are also trying their luck in the politics. However, for Dr Misa, it would be second Lok Sabha election. Prior to this, she has contested in 2014 general election from the same Pataliputra seat and lost to the BJP’s Ram Kripal Yadav by a slender margin of 40,322 votes. Misa is a Rajya sabha member and the eldest among seven daughters of RJD’s Lalu Prasad. Just like Misa, Jaiswal is already a member of the parliament and has been winning the Lok Sabha elections since 2009 from his traditional Paschim Champaran seat. In 2014, he defeated film director and JD(U) candidate Prakash Jha by a huge margin of over 1.10 Lakh votes. Citing records, BJP has once again reposed faith in Jaiswal. Grand Alliance is yet to announce its candidate against Jaiswal who, if wins, will make consecutive three wins in the Lok Sabha.